Let Zip2Tax be the tax specialist for your company, freeing you to concentrate on what you are good at - growing your business. This is an easy manual method for finding sales or use tax rates by typing in any full address or just a ZIP code anywhere in the United States. Available via internet browser, desktop widget, or mobile app, this intuitive interface returns tax rates instantly, calculates the tax dollar amount, shows shared communities, and generates a map. Try the Online Lookup for yourself now. The secure API connects your database to our constantly updated servers to power your eCommerce site with real-time tax data. Our servers boast a 99.9% uptime with more than enough bandwidth to handle requests even during the heaviest traffic periods. Our .CSV-format tables can be integrated with a wide range of shopping cart and enterprise solutions. The initial purchase of the tax tables will provide your company with precisely what you need, from a single state to the entire United States or Canada. Whether you need sales tax, use tax, or both, we will send you the information you need to stay in compliance. You also have the option to subscribe to receive monthly updates which will keep your business up to date with frequent tax rate and ZIP code changes. 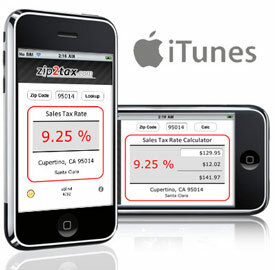 Download our iPhone App for free from iTunes and look up sales tax rates by ZIP code while you're on the go. Do You Know The Facts About The States And Provinces You Do Business In? Get the "Essential Guide to Sales and Use Tax for Small Business"